user who is tired, stressed or simply makes a mistake. Pressure from executives and audit teams to reduce business exposure reinforces their effort, but comprehensive PAM solutions can incur hidden costs, depending on the implementation strategy adopted. With multiple capabilities including password vaults, session management and monitoring, and often user behavior analytics and threat intelligence, the way a PAM solution is implemented can have a major impact on the cost and the benefits. 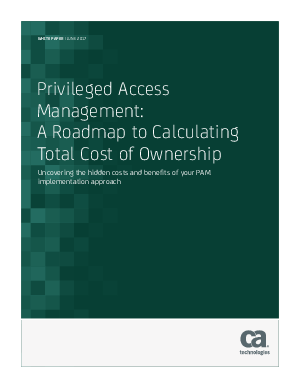 This report provides a blueprint for determining the direct, indirect and hidden costs of a PAM deployment over time.